I am so ready for summer to be over! Fall has always been my favorite time of year. The colors, the cooling weather, the foods, my birthday...all of it. This was also a tough summer for my family. We're doing a lot better now, I think, but I'll be happy to put the season behind me for more reasons than usual this year. My swatch bins are filling up with some great new fall polishes and I'm down to my last few summer ones. Tomorrow's post should wrap it up completely, along with a few waylaid spring stragglers. Today I've got four blue creams from Maybelline's Summer 2013 collection. Nichole already showed us Mint Mist and Sandstorm back in May. To speed summer out the door just a little faster, I'm taking a page from her playbook and doing two finger swatches for these shades. Urban Utopia is a bright turquoise cream. Azure Seas is a cerulean blue cream. Urban Utopia is part of the reason this post is so late. It's similar to Sally Hansen Kiwi Bikini and I actually swatched it a week before that post. It's just as difficult to photograph and has the same green bleeding weirdness. The formula is *much* better than Kiwi Bikini though. It's self-leveling, thin, and two coats of Urban Utopia are much easier than one coat of Kiwi Bikini. It even does that magic trick of having any bubbles that show up come to the surface and vanish. Love that. Great formula! Azure Seas is almost a one-coater, but I used two to make sure it wasn't patchy. The color's not unique, but the formula is really nice. Pacific Blues is sky blue cream. Midnight Swim is a deep blue cream with green undertones. 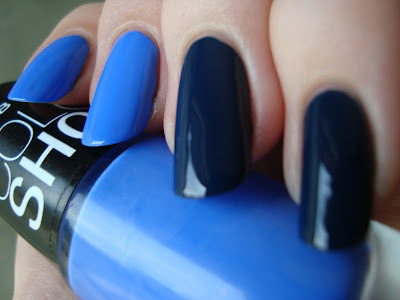 Pacific Blues is closer to Sally Hansen Pacific Blue in name than it is in color. I'll probably compare them some day, but it's a bit lighter and not as dusty. The formula is thick, but not tricky. This is two coats. Midnight Swim is deep, dark, and stunning. I haven't compared them yet, but I think it's probably not that far off from the other navy-ish blues we saw from a few brands over the spring and summer. The formula's good here too, but on the thin side. This is also two coats. Bottom line: I'm not sure if these are still out there. I think I've seen them around recently though. If you happen upon them, the colors aren't all that special but they've all got good formulas. Urban Utopia's is particularly good. So close! I'm dreaming of long sleeve weather. Are you looking forward to the cooler (or if you're on the other side, warmer) weather?